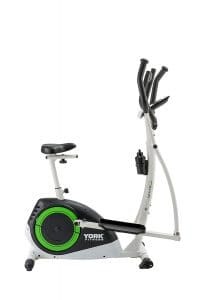 There are a lot of exercise machines that are similar to the York Fitness Active 120 2-in-1 Cycle Cross Trainer, but this model seems to be one of the few that fall under the mid-range level. York Fitness identifies this model as an entry-level option, but I think it could suit various fitness levels with its wide range of magnetic resistance levels and a good number of built-in workout programmes. If you’re torn between buying a cross trainer or an exercise bike, this single machine is equipped with both of them! You don’t have to be sceptical about building a home gym even if your space at home is at a premium. 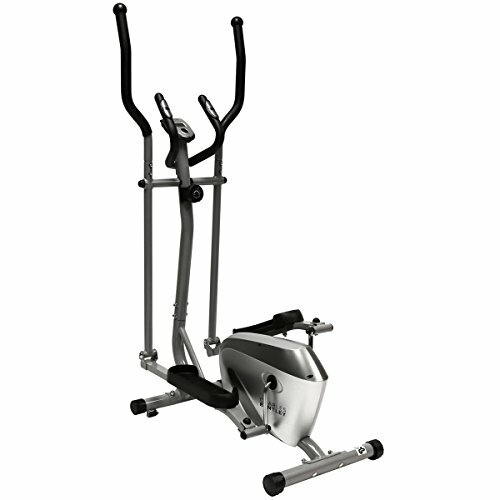 The York Fitness Active 120 2-in-1 Cycle Cross Trainer is among the many exercise machines that can fit in limited areas as it only measures 120 cm in length, 62cm in width, and 152cm in height. It’s also very lightweight at only 42.5kg, yet it can support a maximum user weight of up to 110kg. This multifunction equipment is also equipped with a 7kg (15.4lbs) flywheel that doesn’t only ensure a quiet operation but also contributes to the stability of the machine. With all these features at hand, you’ll be able to safely ride on this cross trainer bike without occupying too much space. As a hybrid cross trainer, this exercise machine should provide comfort for both kinds of workout. 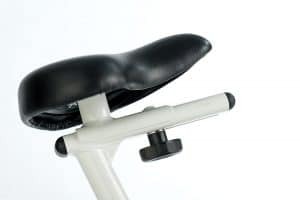 Thankfully, it has a height adjustable, wide and padded saddle, so your body is at ease when using it as an exercise bike, while its large foot pedals keep your feet in place when being used as a cross trainer. 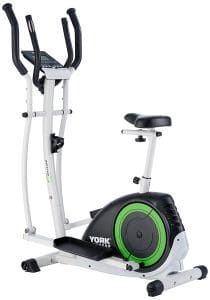 The York Fitness Active 120 2-in-1 Cycle Cross Trainer also features fixed and moving handlebars to enable you to work out not only your lower body but also your upper body at the same time. The fixed central handles are also equipped with hand pulse sensors, so you ensure that you’re making the most out of every workout session. A complicated console can be frustrating especially for beginners who are really not familiar with fitness machines. 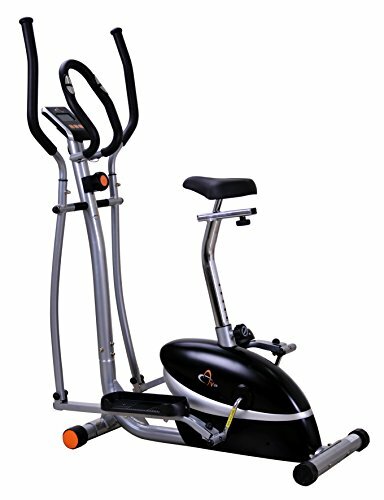 The York Fitness Active 120 2-in-1 Cycle Cross Trainer is an excellent choice if you have a little to zero knowledge about gym equipment because its intuitive LCD console is simple and straightforward. You can quickly monitor your progress on the 5.75-inch LCD display as it measures your time, pulse, distance, speed, calories, RPM, and watt. For you to achieve optimum results, it’s recommended that you add some intensity to your workout. With that said, it’s a good thing that this machine provides 16 levels of computer controlled magnetic resistance that can be simple on low levels and be challenging when it’s set to higher resistance. 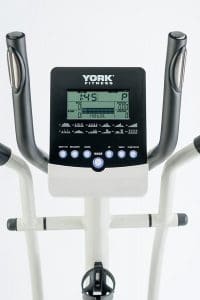 The York Fitness Active 120 2-in-1 Cycle Cross Trainer also features a selection of 17 programmes including 12 pre-set, three heart-rate controlled, one user-defined, and one manual workout. These can supply you with a week’s worth of workout routines so you can always look forward to your next session. The York Fitness Active 120 2-in-1 Cycle Cross Trainer has a stride length of 30.5cm (12-inch), making it more ideal for shorter users. However, some customers have confirmed that even at the height of 6ft, they found the machine comfortable to use, so it depends on how intense you want your workout to be. This cross trainer bike also has built-in transport wheels as well as a bottle holder that make it even more convenient for home use. 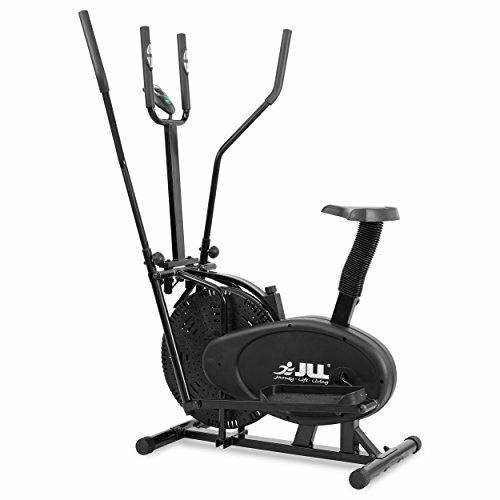 The JLL 2-in-1 Elliptical Cross Trainer Exercise Bike CT100 is also a multifunctional machine that can fit any budget. It can support a maximum user weight of up to 110kg because of its durable steel frame. This cross trainer bike is unique among its kind as its direct chain-driven, meaning it can simulate the feeling of riding an outdoor bike. Although it has a resistance dial, it has no specific number of levels because as you turn the knob, it loosens or tightens the tough band that’s wrapped around the flywheel. This gives you total control over how much resistance you want to add to your workout. For a long-lasting and sleek looking finish, the machine is also covered with a powder coated paint. Another budget-friendly option when it comes to hybrid cross trainers is the V-Fit MCCT-1 2-in-1 Cycle Cross Trainer. The machine is lightweight at only 36kg yet its stable as it can hold a maximum user weight of up to 110kg. Its silent magnetic flywheel weighs 4.5kg, and it has a straightforward 7-function console that directly shows your stats such as theoretical calorie burn, distance, hand pulse readings, and more. This cross trainer bike also features a height-adjustable saddle that’s large and padded for your comfort, and oversized non-slip footplates to support various users. V-Fit MCCT-1 2-in-1 Cycle Cross Trainer Detailed Review? CLICK HERE. If you want to get the most sought-after cross trainer bike in the market, then the XS Sports Pro 2-in-1 Elliptical Cross Trainer is the one you’re looking for. This entry-level machine remains the number one bestseller on Amazon despite having hundreds of competitors in the marketplace. It doesn’t offer a lot, but its affordable price and good quality give excellent value for money. This machine has a maximum user capacity of 110kg, and it already comes with built-in pulse sensors as well as adjustable resistance to add intensity to your workout. Its wide foot pedals can accommodate a maximum of size 12 (UK size), and its overall simplicity make it suitable for any home gym. The Charles Bentley Fitness Elliptical Cross Trainer is purely a cross trainer, and it’s an excellent choice if you’re serious about improving your fitness level. Given the fact that it’s manufactured from a brand that has been creating reliable products for more than a century now, you shouldn’t be worried about is overall quality. It may seem as though it’s an entry-level machine, but its eight levels of magnetic resistance can be tough even for fit users. This equipment already comes with built-in hand pulse sensors and a 4kg flywheel, at a price that won’t cost a lot of your hard-earned money. 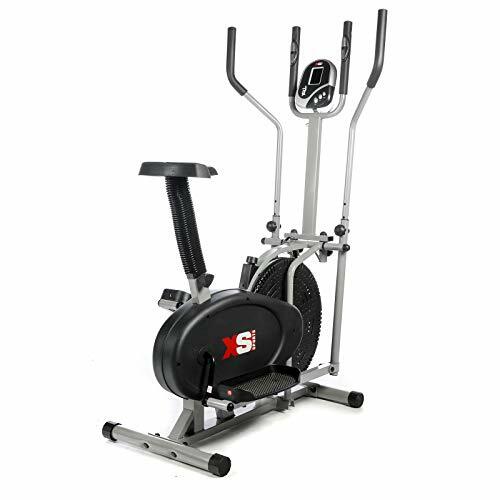 After comparing the York Fitness Active 120 2-in-1 Cycle Cross Trainer with other models of the same kind, you may feel as though it won’t be necessary to spend more for this if there are cheaper options. However, it’s always important to look at the features that will be useful in achieving your fitness goals. With a wide range of resistance, a heavy flywheel, and a great selection of workout programmes, I must admit that this cross trainer bike will give you the bang for your buck.